Baby girl is growing bigger and bigger every day. And every day I tell her to slow down. From her tiny (constantly moving) hands to her teeny tiny toes, I can't imagine her getting bigger. With Mother's Day just around the corner, I wanted to find the perfect gift for my mom, as this is her first as a Grandma. Being the coffee and tea lover that she is, we decided to make her something special that will not only allow her to enjoy a favourite hot beverage, but also freeze baby girl's tiny feet in time so that she can remember her at this precious age. 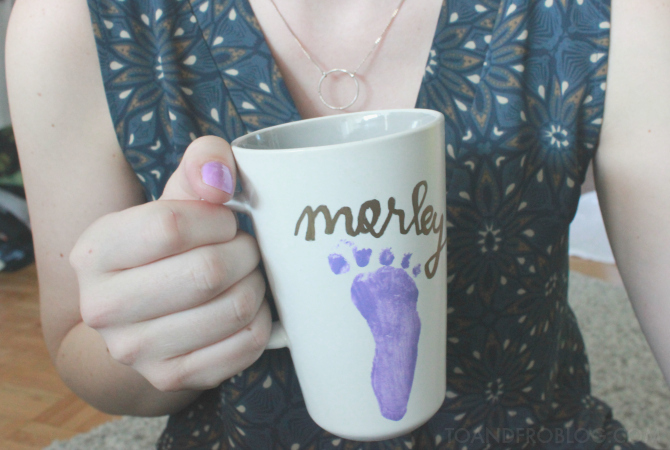 This easy footprint mug DIY is the perfect keepsake for any mothers, grandmothers, or other family members (because everyone will want one once they see it), in your life. 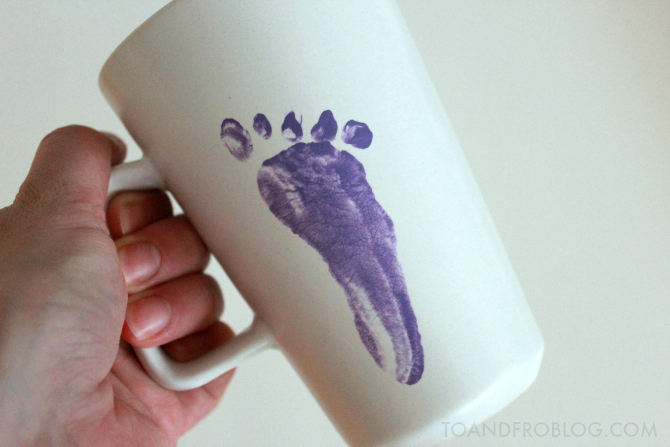 *Make sure the mug is large and flat enough to fit your baby's foot or hand print. Baby girl's hands are always moving, so I opted to use her foot print. Therefore, the mugs I chose had to be tall enough to fit her big foot. 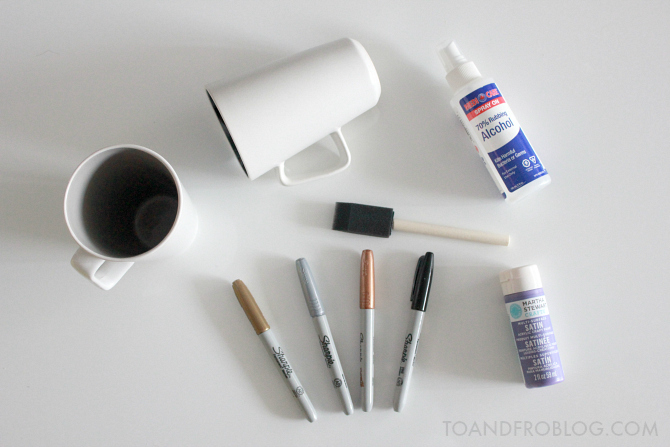 The mug also does not need to be white - just make sure that the paint colour that you chose is visible against the mug. Clean the mug thoroughly with the rubbing alcohol and paper towel. 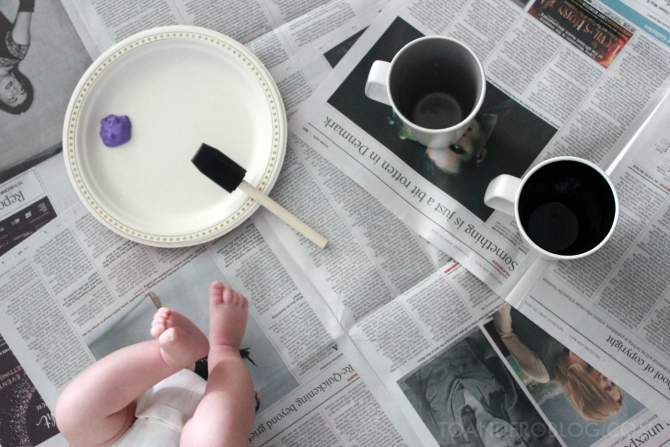 Pour paint onto flat surface, such as a paper plate. Using the brush, fully coat the bottom of baby's foot or hand. Press foot or hand firmly on the side of the mug. If you do not like the way it looks, immediately remove paint with baby wipe and dry with paper towel. Repeat steps 3 & 4. Once you are happy with the print, use the baby wipes to clean the paint off baby. Make sure to be thorough and that all the paint is removed (in case they like putting their hands in their mouth). Allow paint to air dry for 1 hour. 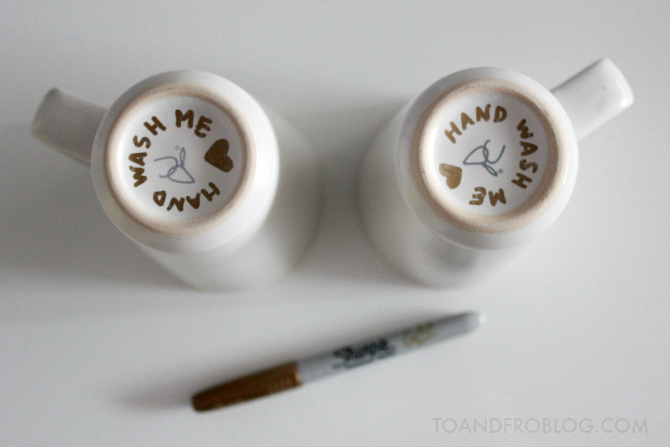 Using the sharpie, add wording, such as baby's name, to the mug. TIP: Write the design in pencil first and trace over it with the sharpie. Once the paint is dry, place the mugs in a cold oven. Heat to 350 degrees F and bake for 30 minutes. It is important the oven is cold as the mug needs to heat gradually. Once the time is up, turn off the oven and allow to cool with mugs in it. If the wording is not dark enough, retrace with sharpie. Repeat steps 8 & 9. It is best to wait a few days before using the mug to make sure that the paint has set. I also recommend having the recipient hand wash the mug after use, as the paint may wear over time if placed in the dishwasher. To remind Grandma, I wrote instructions on the bottom of the mug using a sharpie. We filled the mug with candies before giving it to the Grandma. 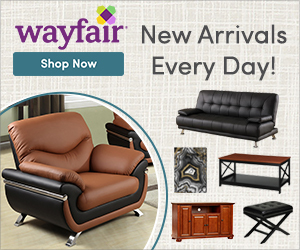 You could also fill it with an assortment of coffees and teas or some fresh flowers. Baby girl wasn't very fond of the activity, but too bad, I knew my mom would love it. And love them she did! The perfect [Grand]Mother's Day gift. What fun Mother's Day gifts have you made?